So many citizens of the Tar Heel state have rushed to order their Confederate flag license plates that the North Carolina DMV has run out of the tags, officials report. Department of Motor Vehicles spokesman Mike Charbonneau reported that in the last 10 days the department has received a whole nine-months- worth of orders for the tags featuring a Sons of Confederate Veterans Logo. 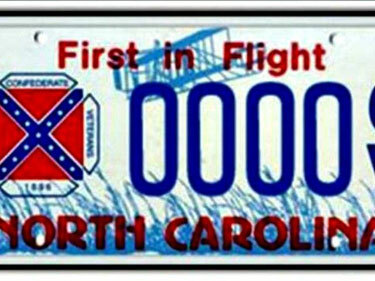 The N.C. DMV says that it will be at least 30 days before the plates will be back in stock. The rush of orders came on the heels of N.C. Governor Pat McCrory’s claims that he’d like the legislature to end the issuance of the Confederate flag plates. At the end of June, the Governor urged the legislature to pass a law to end the official designation of “civic club” for the Sons of Confederate Veterans organization and to stop issuing plates with the C.S. flag emblazoned on them.